I’ve had such a great time teaching dance at Society for the Education of the Crippled (SEC). The smiles and excitement that each child had was overwhelming and heartwarming. My fellow dancers surprised me every day with new, innovative, and thoughtful exercises for the kids to do. It was amazing to see the growth of each dancer as the week progressed. We ended our time at SEC by having a discussion about the importance of movement for children with disabilities, which was a time full of heartfelt conversation and compassion for the well being of the children of SEC. The kids were sweet enough to paint vases for all of us as a keepsake :). We spent 3 days with a boys cricket team in Juhu, coached by Nisha’s uncle Tony. He coaches these boys who are from surrounding slum areas, and he practices with them for several hours every single day. It was incredible how big his heart is to give his time and effort into bettering these boys lives. We had a fun time teaching them some hip hop, and learned a little bit about cricket. There’s definitely a reason that we are dancers and not sport athletes… But we tried anyways, and the boys got a laugh out of it. We also spent 3 nights teaching workshop classes at Sumeet Nagdev Dance Arts. We each taught one class each night in varying styles. The energy in the studio was off the charts and the students all were thirsty for any type of movement. I was happy to see how willing the students were to learn, and how well the teachers brought joy to the students through dance. We also took a quick trip to Juhu Beach after leaving the cricket boys. The connection with nature that you feel when the breeze is on your skin and your feet are in the ocean was completely freeing. Pictures can only capture so much, as can words. This post can attempt to show how this week has gone for me, but it doesn’t even scratch the surface about how this week FELT. I’m incredibly thankful to have been able to meet such a diverse group of individuals who share my passion for dance and unity. The amount that I have learned about India, and about myself keeps growing every day. I’m honored to work alongside Nisha, Mei, and Anna, who are the reason I’m here right now, as well as the other dance diplomats. These women have the biggest hearts and are never afraid of showing the world what they are passionate about. 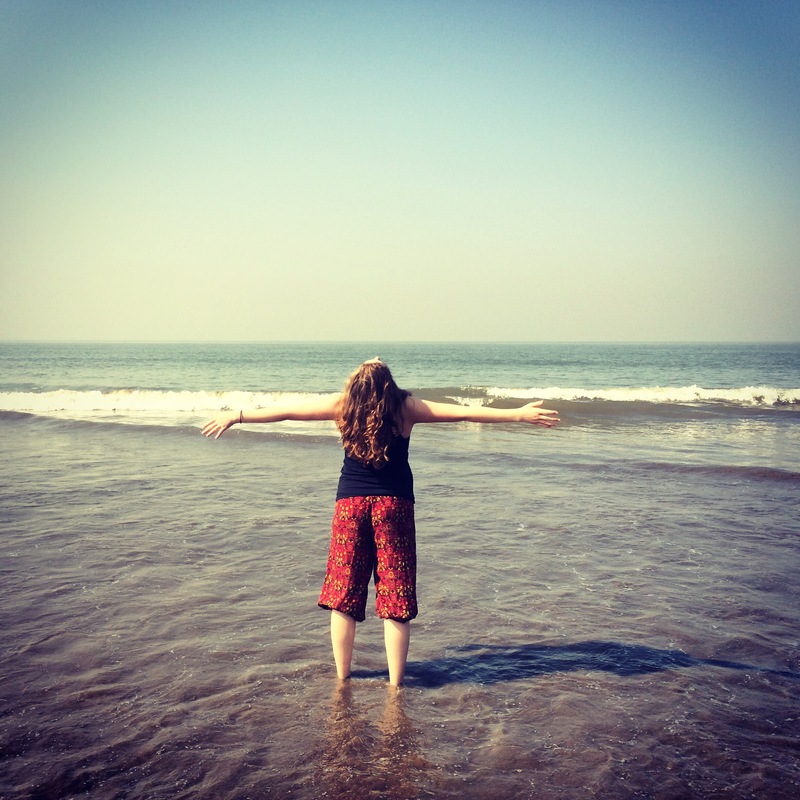 I leave a part of myself in Mumbai, and I take much much more. This week has taught me a lot about unconditional love, the power of movement, and the importance of connection. This picture shows the beach and myself, but not the wind, the smell, or the sounds; just as this post shows the surface of my experience, but not the feelings of pure joy I’ve experienced this week. Here’s to another wonderful week: in Kolkata!